You may have noticed recently that something strange happened to Spotify’s playlists. They were taken over by Drake. All of them. Even the ones that didn’t have a Drake track in them. There was Drake on the cover of Songs To Sing To In The Car smiling in a car, Drake looking out of the window of a helicopter, admiring the early morning sunrise for Daily Commute. Oh, and there he was again holding what seems to be a bra for Slow Jamz. This was all part of a promotional campaign for his latest, surprise album Scorpion which is now on Spotify. All 25 tracks of it, which is the equivalent of listening to Kanye’s ye three times and still having time for one more track. In short: it’s a lot of Drake and while it meant the album smashed Spotify’s streaming record with 132 million streams on its opening day, but it’s proving too much for some. 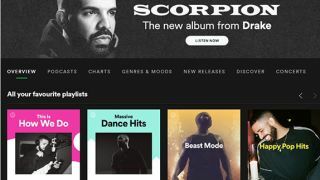 On Reddit, one user has caused a storm by revealing that he asked for a refund for his Spotify subscription and got one - all because he wasn't happy with the Drake takeover. "I just messaged Spotify customer service on their website and told them I wanted a refund since this is advertising and I pay for premium with no ads, and they have now refunded my last payment," wrote Schwagschwag. Searching through the comments, though, and it doesn't look like this is the case for every angry user. Another poster was keen to point out that while Drake was on the cover of every playlist, his music was actually in fewer that 50% of them. Spotify has yet to comment of the Drake takeover. For Drake fans, we're sure it was their Christmas Day. But for those who just wanted a bit of cinematic chillout to accompany their day and not hear Drake banging on about how he started from the bottom, we're sure Apple Music and others started to look tempting. Spotify review: king of the audio streamers?